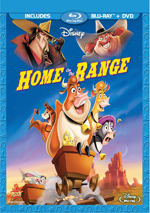 Round up the family and get ready for a whole lotta fun with Disney's hilarious animated comedy Home on the Range. It's a "total joy," raves Gene Shalit, The Today Show. When a greedy outlaw schemes to take possession of the "Patch Of Heaven" dairy farm, three determined cows, a karate-kicking stallion named Buck, and a colorful coral of critters join forces to save their home. The stakes are sky high as this unlikely animal alliance risks their hides and match wits with a mysterious band of bad guys. Experience Disney's new moo-vie adventure with spectacular bonus features, stunning animation, and original songs performed by k.d. lang, Bonnie Raitt, Tim McGraw, and The Beu Sisters and written by the Academy Award-winning composer of Beauty and the Beast and Aladdin. It's "good fun for the whole family," declares Leonard Maltin. $13.880 million on 3047 screens. At the time, 2004’s Home on the Range appeared to mark the end of an era. 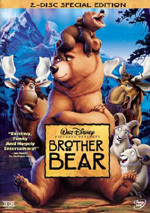 At the time, it looked like it would be the last Disney animated film to use traditional cel methods; the studio planned to go all CG after that. 2009’s The Princess and the Frog ultimately ensured that Range wouldn’t be the end of the cel line, however. Which is good, as Range didn’t send the format out with a bang. The film lacked much personality and failed to become something special. At the start, we meet “show cow” Maggie (voiced by Roseanne Barr), the only critter left on a farm victimized by cattle rustler Alameda Slim (Randy Quaid). Penniless and forced to auction his property, Abner (Dennis Weaver) moves west and leaves Maggie on “Patch of Heaven”, a lovely dairy farm. There she causes a ruckus with her outsized personality. We meet fellow cows like the prim and proper Mrs. Caloway (Judi Dench) and the bubbly Grace (Jennifer Tilly) as well as some other denizens. Unfortunately, a dark cloud enters the picture when Sheriff Sam (Richard Riehle) delivers a foreclosure notice to Heaven owner Pearl (Carole Cook). She has three days to raise the $750 she owes or she’ll lose the farm. Maggie urges the others to enter the county fair and win the needed money there. Mrs. Caloway dislikes the idea and opposes Maggie but she eventually agrees to assist. Maggie, Grace and Mrs. Caloway depart to move this plan into action. We also meet Buck (Cuba Gooding Jr.), the sheriff’s horse. He feels frustrated with his quiet, low-key lifestyle and fantasizes that he’ll get to actively battle baddies. When bounty hunter Rico (Charles Dennis) comes to town and needs a fresh horse, Buck lands himself the gig. They plan to head out after Slim, and when the cows hear about this, they get an idea. Since the reward for Slim’s capture just happens to equal the $750 they need, they decide to go after the rustler. They participate in a cattle drive and eventually run into Slim himself, at which time we learn the villain nabs cows via his hypnotic yodeling. He then pretends to be “Y. O’Del” and purchases the farms to become the realm’s biggest landowner. 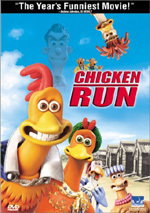 The rest of the movie follows the cows’ pursuit and all the obstacles and dilemmas that pop up along the way. Range doesn’t exactly boast a scintillating plot, but how many Disney animated flicks do? Most of them operate off of the usual simple story combined with basic moral combination. It’s what the execution that makes the movies special. Unfortunately, Range lacks the personality to overcome the ordinary story. It takes its cues mainly from glib flicks like The Emperor’s New Groove and Aladdin, as it shoots for the same style of wisecracking nuttiness. It just doesn’t manage to match up to those offerings, perhaps because it lacks a strong comedic talent in the lead. David Spade and Robin Williams helped propel their respective flicks, but the usually-annoying Roseanne can’t motivate personality into Range. The fairly feeble script doesn’t help. The movie includes all the right elements but they never quite coalesce and turn into something lively or creative. Instead, the film feels cobbled together with a nod toward the right properties but without the spark or inventiveness of better Disney comedies. That remains the biggest problem with Home on the Range: it seems relentlessly ordinary. The actors try desperately to sell the material but can’t overcome its inherent lack of inspiration. This renders Range watchable and superior to some of the studio’s more boring efforts – it definitely beats snoozers like Dinosaur - but it remains a pretty lackluster product. Home on the Range appears in an aspect ratio of approximately 1.66:1 on this Blu-ray Disc. This became a consistently terrific presentation. Sharpness appeared excellent. At all times, the movie looked concise and distinctive, without any signs of softness on display. I witnessed no jaggies or shimmering, and edge haloes failed to materialize. Source flaws caused no concerns and stayed absent. Range enjoyed a suitably cartoony and lively palette with a Western tint, and the disc replicated those tones well. The colors always came across as tight and vibrant. Black levels also seemed deep and rich, while shadow detail looked appropriately dense but never became too thick or opaque. From start to finish, the film offered top-notch visuals. As for the DTS-HD MA 5.1 of Home on the Range, it worked pretty well for the movie. Music showed nice stereo separation, and a lot of environmental and other specific effects cropped up from the sides. The soundfield showed a good level of activity and made the front domain reasonably lively, with nice blending and movement. Surround usage added good reinforcement of these elements and came into their own when appropriate, such as during fights or a storm. The forward spectrum led the way, but the back channels offered a fair amount of material as well. Audio quality appeared solid. Speech came across as natural and concise, and I noticed no issues related to edginess or intelligibility. Music sounded clean and full, while Effects also seemed accurate and vivid. Some moments stood out as particularly powerful, such as the arrival of the train or an explosion toward the end, and the effects always showed nice clarity. This wasn’t a truly terrific mix, but it added to the experience. How did this Blu-Ray compare to the original 2004 DVD? Audio came across as more dynamic/full and also demonstrated a more engaging soundfield. Visuals seemed significantly better defined and more vivid, with livelier hues and stronger clarity. In all ways, the Blu-ray offered the superior presentation of the film. Most of the DVD’s extras reappear here. We start with an audio commentary from writers/directors Will Finn and John Sanford and producer Alice Dewey Goldstone, all of whom sit together for a running, screen-specific chat. Like most Disney animation tracks, this one seems bright, bubbly, and reasonably informative. We get a lot of information about the film’s evolution, with remarks about cut sequences, changes of pace and characters, and various parts of the decision-making process. Happy talk pops up pretty frequently, and we also get lots of notes about who was responsible for what part of the flick; both elements get a little tedious at times. Nonetheless, the commentary gives us a good level of information and moves along nicely. A collection of four deleted scenes follows. This section starts with a 37-second introduction from Finn and Sanford; they simply explain the concept of deleted scenes. As for the clips themselves, they run a total of 14 minutes, 20 seconds; that total includes scene-specific introductions from Finn and Sanford. The snippets vary from simple story reels up to rough pencil art; no fully finished footage appears. Since little in the final film seems particularly entertaining, I didn’t anticipate much from these scenes, and my low expectations were warranted. The segments would have slowed down the movie even more, and they lacked much amusement or excitement. Sanford and Finn’s introductions give us good notes, however, as they aptly let us know what the scenes intended to do and why they got the boot. Up next we find a music video for “Anytime You Need a Friend” by the Beu Sisters. It’s little more than the usual lip-synch/movie snippet blandness, though the Sisters are attractive enough that I won’t complain. Under YodelMentary, we locate a two-minute, 43-second piece. It provides a quick, glib, and not very interesting look at the history of yodeling. After this we find a 10-minute, 15-second Art Review. In this, we check out look at research photos and concept drawings while we hear from Maltese and art director David Cutler. They discuss the processes they went into the visual and character design of the movie. It’s an informative and tight look at its subject. The Joke Corral (4:34) tells us cracks - presented in the style of Laugh In and its folks behind windows - and lets you toss out your own funny; do so and hit a button to get a reaction from a character. We get 18 pre-programmed jokes in all, and while none seems scintillating, the presentation’s cool. It uses an interesting cutout style of animation (ala South Park) and also features all the original voice actors. This makes it more endearing than it might have been. Range tosses in an animated short called “A Dairy Tale: The Three Little Pigs”. This uses the same style as the look of the “Joke Corral”. We watch Mrs. Caloway retell the “Three Little Pigs” story in this three-minute, 29-second piece, but other cast members constantly interrupt her. It’s cute and fun. The disc opens with ads for Cinderella and The Odd Life of Timothy Green. 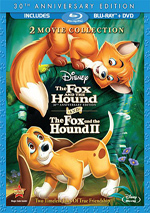 These also appear under Sneak Peeks along with promos for Secret of the Wings, Lady and the Tramp II: Scamp’s Adventure, Pocahontas, The Aristocats, The Rescuers, Beverly Hills Chihuahua 3, Planes and The Tigger Movie. A second disc provides a bonus DVD of Range. This offers the same extras as the Blu-ray. Does the Blu-ray lose anything from the old DVD? Yup – it drops a few games and activities. I can’t say I miss them, but I’m surprised they weren’t included on the package’s bonus DVD; why not ensure their presence their? Home on the Range doesn’t represent a strong moment for the studio. It seems tepid and without much pep to make it entertaining. The Blu-ray offers excellent picture, very good audio and a fairly nice set of supplements. Unfortunately, the movie itself is average and best left for Disney diehards.